The Imo state government has commenced the payment of 6-months pension arrears owed to pensioners in the state. During the official handing over of Cheques to the pensioners, the Imo state Governor Rochas Okorocha said that the government has also agreed to pay the pensioners in full rather than the earlier plan of slashing the arrears by 50 percent. 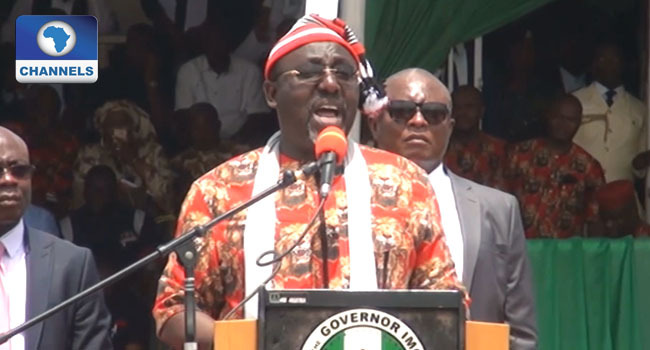 “Now, we can say the issues surrounding the payment of pension arrears in Imo state could be laid to rest following the decision of the government to pay 6-months backlog of arrears 100 per cent and not slashed. The pensioners in their numbers gathered at the Imo state international conference center in Owerri anxiously waiting to meet with the Imo state Governor and also collect their cheques. The Governor commended the pensioners for their patience, while giving reasons for the delay in payment of pensions and government’s earlier plan to slash the pension, he noted that sudden over blotting of the pensions and corrupt malpractices by some government officials are some major reasons. The Governor further questioned the corrupt activities of some of the pension commission officials in the state while ordering security operatives to arrest over 15 of them for embezzlement and corrupt malpractices. He maintained that the state government is committed to sanitizing the system and getting rid of all corrupt malpractices. Afterwards, one after another the pensioners queued up to receive their cheques accordingly. Some of the pensioners who spoke with Channels Television expressed delight over the new development urging the government to continue in this path so pensioners can remain happy after a meritorious service to the state. It could be recalled that before now, there has been a disagreement between the pensioners in the state and the Imo state government over a form issued by the government directing pensioners to sign an undertaking that only 50% monthly pensions would be paid to them by government and in disagreement with the directive, the Imo state branch of Nigerian Union of Pensioners dragged the state government to court over government’s refusal to pay 100 percent accumulated arrears of pensions to pensioners in the state.